Once upon a time, war reared its ugly head right in the heart of Walkerville, Canadian Club whiskey founder, Hiram Walker’s peaceful and thriving company town. In 1915, a business was targeted by a group of dangerous fanatics. Hiram had been dead for 16 years, but no doubt his sons and grandsons, who were running Hiram Walker’s & Sons, as well as the town, were shaking in their boots. The Peabody Building, once located on the southwest corner of Riverside and Devonshire, was a Walkerville landmark for many years. Situated beside the Peabody bridge, the familiar complex was the home of many companies and associations over the years, despite the attack it endured during World War I close to a century ago. The building first housed the Peabody Leather Label Overall Company, which produced the famous Peabody brand overalls, known by the shiny buckles on their shoulder straps. During World War I, the company manufactured uniforms for the British Army. The company had only been in business a few years when American-based German sympathizers tried to blow up the building at 3 a.m. on June 21, 1915. The sympathizers placed a bomb in a hole under the building, next to the old wooden Peabody Bridge. The framework on one side of the bridge was blown away, and the other side was twisted and bent; the concrete crumbled to powder. The force of the explosion also was strong enough to blow out every window in the building. Some of the window sashes also broke and a few sills snapped. There were no reports of injury to anyone in the vicinity. Repairs were made, and the building went on to live a long life, becoming the starting place of several companies. 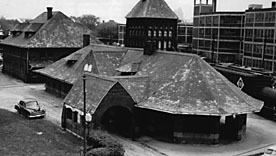 RPScherer, which produced gelatin for pharmaceutical companies, occupied the building for several years, as well as Butcher Engineering Enterprises, Lorence Enterprises, Reid Industries, and the McCord Corporation. The building also provided space for Junior Achievement of Windsor. 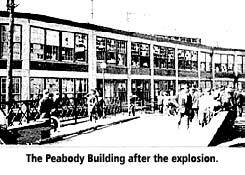 The Peabody Building was demolished in 1985, while the neighbouring Walker Power Building was spared [and still stands today]. Read more about the company town of Walkerville and its visionary founder, Hiram Walker, in this story on our archive site, walkervilletimes.com: A Walkerville Snapshot: 1913. This entry was posted in Lost Buildings, People, Walkerville, Windsor Now, Windsor Then and tagged 1915, bomb, Canadian Club, company town, demolished, fanatics, Hiram Walker, industry, lost, overalls, Peabody Building, scary, Walkerville, war, WWI. Bookmark the permalink.